The saving one million lives Initiative was launched in October 2012, in response to the poor health outcomes in the country especially for mothers and children. Thus,the program is intended to improve the lives of mothers and children through a result based partnership with States ministries of health. 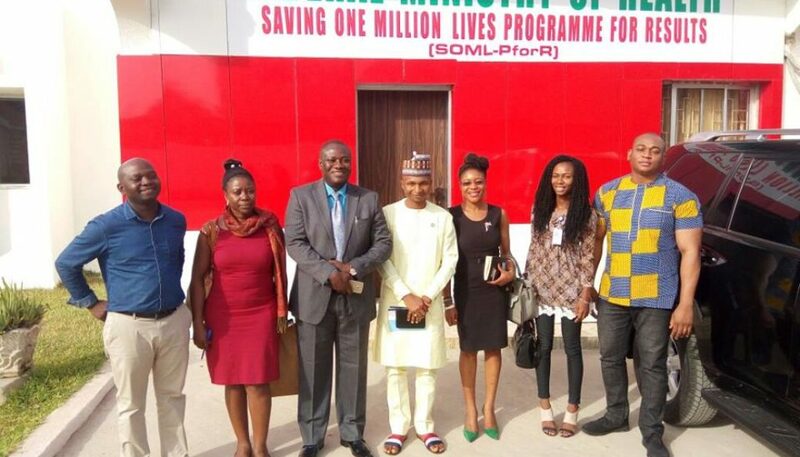 On the 16th of March, the team at CODE met with Dr. Ibrahim Kana the Program manager of Saving One Million Lives Program for Results to get an extensive elucidation of how the program is being run and what it entails. – the prevention of mother to child transmission (PMTCT) of HIV. He stated that the states were receiving 82% of the money and the program unit is not involved in the spending of the money, also that the SOML Program involves reorienting the discussion of service delivery to results rather than just inputs, establishing a limited set of clear and measurable indicators by which to track success, strengthening data collection so that these indicators can be measured more frequently, bolstering accountability so that managers and health workers at all levels are engaged to achieve better results and fostering innovations that increase the focus on results and include greater openness to working with private sector. He highlighted that The Program for Result is an approach to structuring of flow of resources to pay for results, outcomes and inputs and under it, states will be rewarded for their performance based on objective indicators using data from household and health facility survey as well as achievement of certain process indicators related to implementation of a performance management system. The program is placed in the Federal Ministry of Health and will be overseen by a Steering Committee chaired by the Honourable Minister of Health and comprising representatives from the state’s commissioner of health which is ultimately responsible for achieving the PforR indicators and ensuring stakeholders’ focus on objectively verified results. DLI 1.- Increasing Utilization of High Impact Reproductive, Child health and Nutrition Interventions; this will include states producing plans for achieving reductions in Maternal and Under 5 Child mortality, Improvements from states’ baseline on key health indicators such as penta 3 vaccination, insecticides treated nets used by children under 5, contraceptive prevalence rate, Vitamin A coverage, Skilled birth attendance and HIV counselling and testing during antenatal care. Lagging states are also encouraged to strengthen their MNCH weeks as part of an impact evaluation. DLI 3 – Improving Monitoring and Evaluation systems and Data Utilization; by conducting SMART surveys in all 36 states and widely disseminating the results. DLI 4 – Increasing Utilization and Quality of Reproductive and Child Health and Nutrition Interventions Through Private Sector Innovation: A competitive innovation fund was established that supports innovations for techniques and technologies in health service delivery. This is been headed by the Private Sector Health Alliance of Nigeria. DLI 5- Increasing Transparency in Management and Budgeting for PHC: States are required to transfer health staff to entity responsible for PHC while produce and publishing a consolidated budget execution report covering all income and expenditures for PHC. Speaking on the disbursement arrangement, he stated that once state earnings have been determined and verified, the PMU will set in motion the disbursement process. As soon as the World Bank receives a withdrawal application, funds will be disbursed to a dedicated account of the Federal Government for transfer to the accounts states have in Central Bank within 30 days. The meeting with the Program management unit was very insightful, as a lot of questions we earlier came with were clearly answered but that did not leave us without having a few “asks” and recommendation that we hope will enable us at FollowTheMoney to effectively monitor and track the I.5 million dollars allocated to states. the National Orientation Agency should be carried along in sensitizing the general public about the program. we asked to obtain a copy of the State’s Implementation Plans.